Under fire for exploiting the legacy of a Canadian hero to score political points, Conservative Leader Stephen Harper said a campaign pledge to support the Terry Fox Foundation was simply honouring a request made by the charity. The party has been reeling in controversy after federal Industry Minister James Moore, who is not seeking re-election, announced Sunday that a re-elected Conservative government would commit up to $35 million to match donations raised during this year's Terry Fox Run. "It was mistakenly assumed that the family was supportive of the funding requested and welcomed by the Terry Fox Foundation. We regret any confusion this may have caused," the party said in a statement issued today. During a campaign event in Winnipeg Tuesday, Harper cited a letter written to him as prime minister from the Terry Fox Foundation and the Terry Fox Research Institute requesting government support. "In August this year we received a request from the Terry Fox institute and the Terry Fox foundation for these kinds of contributions and matching funds we're setting up," he said. "This was the request made and we've fulfilled that request. I think it's a great policy and I encourage all Canadians to contribute to the legacy of fighting cancer that Terry Fox left us." In fact, the Aug. 31 letter sought support for a Comprehensive Cancer Centre program in Canada, modelled after one.developed in the U.S. and implemented in other countries such as France, Germany and the United Kingdom. The letter also sought a meeting sometime before the Oct. 19 election, and extended an invitation for Harper to take part in this year's run. "We welcome you to participate at any of the Terry Fox Runs happening on September 20th across Canada," the letter reads. "We will be happy to work with you in providing a speaking opportunity at the start of this year's run." 'Crass politics' without family's permission? NDP Leader Tom Mulcair slammed the Conservatives for using the event to score points. "For the Conservatives to be playing crass politics without the permission of the family or the foundation, I think it speaks for itself about what they're willing to do," he said during a campaign event in Moncton, N.B. "We'll respect that family, we'll respect Terry Fox's memory and we will respect the foundation. We're not going to politicize it — we'll leave that to the Conservatives." POLL TRACKER: Who's ahead in the polls? The Terry Fox family issued a statement Monday refuting claims from the Conservative Party about its multi-million-dollar campaign matching fund pledge. "We need to clarify that we did not respond enthusiastically, suggesting the idea was great, as MP James Moore reported in yesterday's Conservative announcement promising to match the Terry Fox Foundation's fundraising efforts this year up to $35 million," the Fox family said in the statement. "We would always welcome government support of cancer research in Terry's name," said the family. "Specifically, we would hope that all federal parties would come together in this the 35th anniversary year, for Terry and all who run in his name, in support of the Terry Fox Research Institute's proposal for a pan-Canadian comprehensive cancer centre strategy." Britt Andersen, executive director of the Terry Fox Foundation, echoed the sentiment. "As an international non-profit organization, the Terry Fox Foundation is non-partisan," said Andersen. "The foundation welcomes new investment commitments in cancer research from any and all political parties." In Port Moody, B.C, on Sunday, Moore urged other parties to back the campaign pledge. "It would be nice if the other political parties would all double down on our commitment and stand with the legacy of Terry Fox and say regardless of what happens on Oct. 19 that they will recognize Terry Fox as a hero and will move forward. 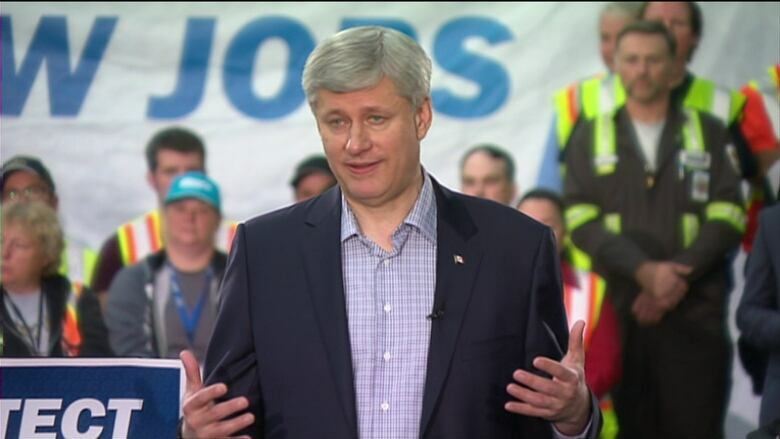 But it's a commitment that will for sure be met by Stephen Harper should he be elected." No one from Fox's family was present for the announcement. "They're aware of it," said Moore when asked about the Fox family. "They're enthusiastic and they think it's great." The outgoing MP also promised the government would provide $12.5 million in capital funding to help establish the Canadian Cancer Society's proposed research and cancer-prevention centre in Vancouver. Remaining funds would come from other levels of government and private donors. Moore added that a Conservative victory would see the government renew its $250-million commitment to the Canadian Partnership Against Cancer when the twice-renewed, five-year program expires in 2017. Harper's wife Laureen was also on hand for Sunday's announcement, and spoke about taking part in the five-km Terry Fox Run with Vancouver-area Tory candidate John Weston.